Start taking the Play Sax By Ear Crash Course. This 6 part video course gets delivered via email over a week. My new ebook gives saxophone students a tool for improving several aspects of their saxophone playing at once while having fun at the same time. 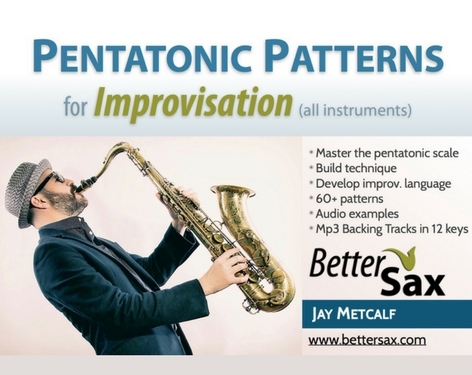 Pentatonic Patterns for Improvisation is on sale now. Get the ebook and 12 backing tracks in all keys today. the new Patterns eBook extends our work with the versatile pentatonic scale into all 12 keys. But I still want you to use your ear! There are over 60 patterns in this book and they are all written out in the key of C (no sharps or flats). Other books of this sort will often provide their patterns and exercises written out in all 12 keys. This makes for a longer book, but doesn’t help the student actually learn anything. What ends up happening if you read the patterns off the page, is you may improve your reading ability, but the musical information will not stay with you. You will always need to read it to get the sounds to come out of your instrument. I have purposely provided each pattern in only one key to force you to use your ear, memorize the patterns, and develop the ability to transpose a pattern into several keys. This may seem like I’m just making you do a lot of unnecessary work, but I assure you that this is the fastest way to learn and get solid results on your saxophone or any other instrument. This approach is also the gateway to developing improvisation skills and is the same method that professional soloists in all styles of music use. If you want to see meaningful progress that stays with you, this method is the fastest way to go. The patterns in this book range from very easy to quite difficult, but it is all relative to the tempo you choose to practice them at and your facility in different keys. There is enough information in here to keep you busy for a very long time. Don’t think that I expect you to learn all of the 60+ patterns though. As you go through the book, you will find some patterns that appeal to you more than others. Focus on these and strive to add them to your kit of improvising tools. Many of these patterns can be heard throughout solos of some of your favorite players. Once you start learning some of them, listen out for similar phrases played by soloists on recordings. Some of the patterns come directly from popular song melodies as well. Since the pentatonic scale is used so universally, these patterns can literally be found everywhere you listen. Learning, practicing, and adding them to your bag of tricks will quickly elevate your playing to another level. Follow the instructions in the book on how to practice the patterns. You will be developing valuable saxophone technique, and training your ears at the same time. I have spent a lot of time, over the years, practicing (and sometimes just noodling) over backing tracks. They are a fun and effective tool for learning to improvise. 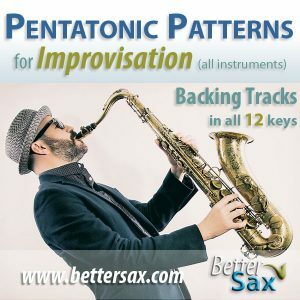 The Pentatonic Patterns eBook comes with 12 backing tracks representing each of the key centers. These tracks are designed to be used together with the patterns or to practice improvising using one pentatonic scale at a time. Each track follows an AABA form. I composed the chord progressions to alternate between a major key and it’s relative minor key. For example, the track for C major, goes to A minor at the B section. This is a very common harmonic device used in songs from every musical style, and is great to get your ears accustomed to hearing, and playing over it. You can also play other scales to improvise over these tracks of course. For the purposes of this book though, I focus on the pentatonic scale. Check out the video below. In it, I am improvising over the first 16 bars of the G minor/B flat Major backing track. Afterwards, it’s just the backing track on its own. Feel free to give it a try. If you play alto sax use your E minor/G Major pentatonic scale over this. If you play tenor or soprano saxophone, use your A minor/C Major pentatonic scale. If you are not sure how to build your pentatonic scales or what a relative minor is, you can learn all of that in some of my free Play Sax by Ear Crash Course. 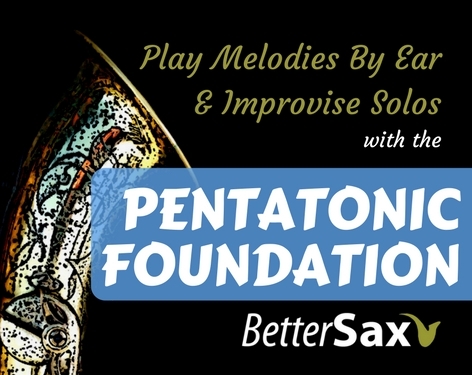 Download the backing track from the video above and a preview of the Pentatonic Patterns for Improvisation eBook here. In the preview PDF, there are a few of the patterns to try out from the book, as well as an overview of the music theory you must know to be able to build and play all the pentatonic scales from memory. Enjoy! I been looking at all your videos on YouTube. Iam a60yrs old intermediate been trying to master this horn like the children of Israel trying to get to the promise land it took 40yrs. I got today and rest of my life to learn how to improvise, play without sheet music or a book. Tell me about your Skype lessons. Jerome, My courses are designed specifically for people like you. I recommend students go through my courses first before Skype lessons. I would go over the same material but it would cost much more. The courses are very clearly organized and you can watch the lessons over and over. Watch the video on this page to get an idea where to start. Will your ebook be applicable to a soprano sax? Yes. It works for all instruments in fact. 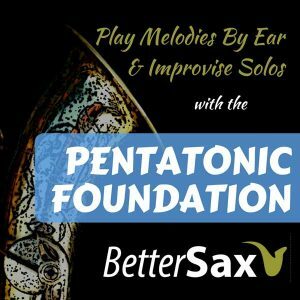 Learn to play melodies by ear and improvise solos using the 5 notes of the pentatonic scale. 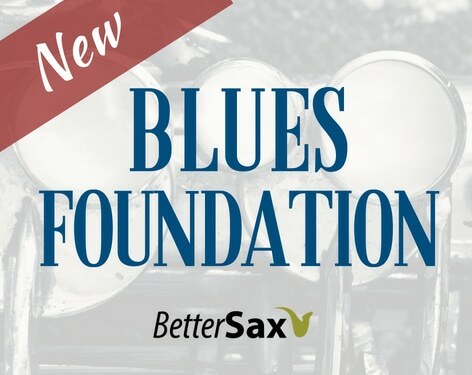 Develop your ability to play improvised solos using the Blues style and language. Develop essential fundamental skills on saxophone. A daily practicing guide for getting results. eBook with 60+ pentatonic patterns and 12 backing tracks in all keys. is a saxophonist who has performed and recorded with some world renowned musicians including Booker T, Graham Nash, Madeleine Peyroux, Larry Klein, Ashford & Simpson, Huey Lewis, Ben Taylor, Chuck D and others. 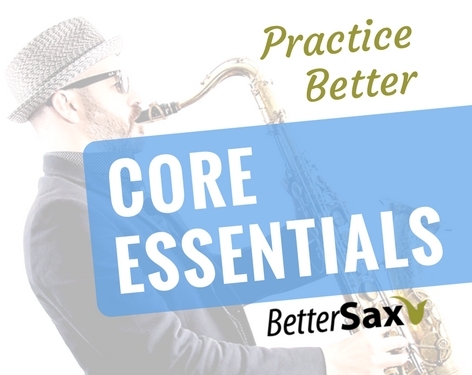 As the founder of BetterSax.com his mission is to help developing saxophone players break away from traditional music learning methods and discover a more efficient, practical and fun way to become a Better Sax player.